Yeah, I know, stuffy title. 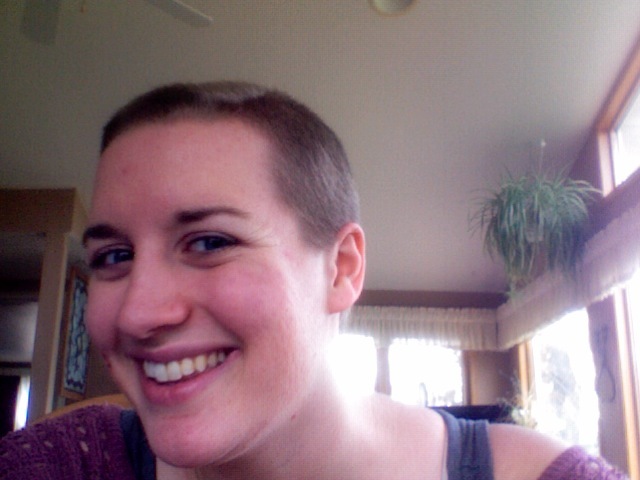 If you’ve been following this blog, you know that a few months ago I shaved my head. Here’s what I looked like not too long before I shaved my head. 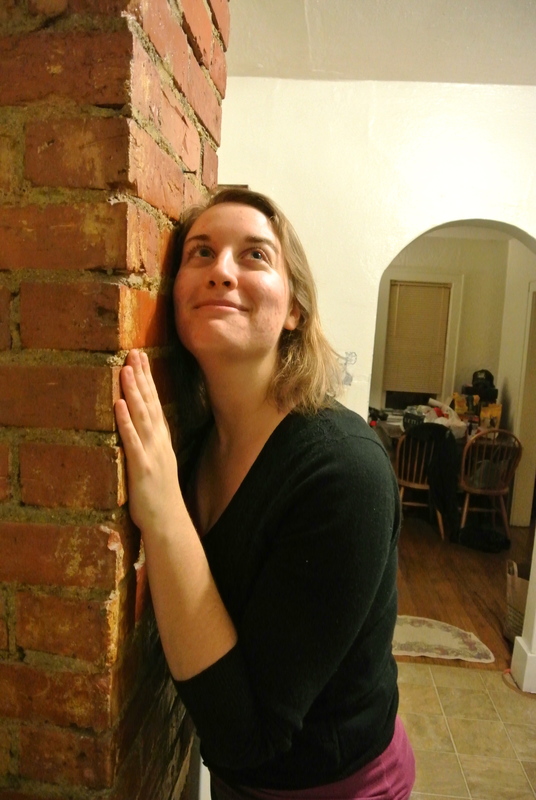 My hair wasn’t really anything spectacular; it was a boring shade between blonde and brown, it was thin, it was limp, and I never knew what the hell to do with it. Everyone told me not to shave my head, saying it would look terrible, but I was at the point where I didn’t even care if I looked ugly; I just didn’t want to deal with my hair anymore. It felt like an enemy, not a part of me. 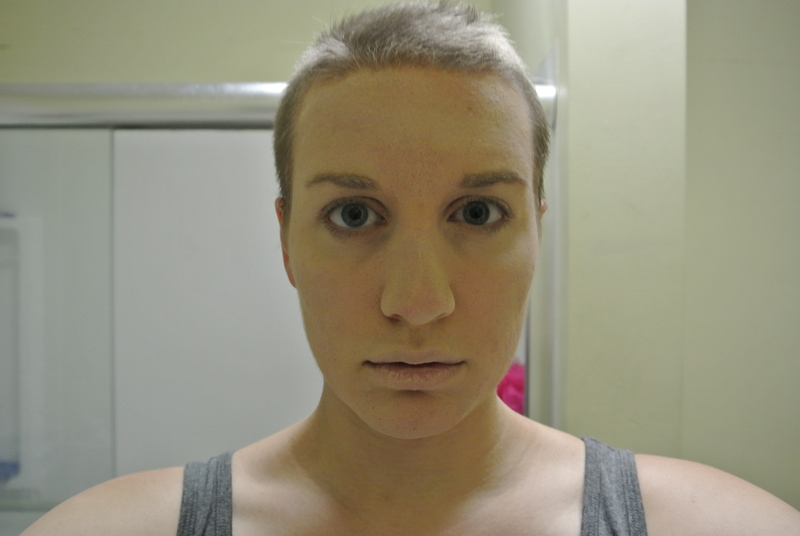 I was completely shocked how much more feminine I looked with no hair! Something about having all that hair away from my face brought out my feminine features and the shape of my head. I was completely in love with it and felt more beautiful than I had in a long time. So if shaving my head (doing something known as very un-feminine) made me feel more womanly than ever, what would happen if I did the opposite? In other words, what would happen if I did something very feminine to my face? One night, while bored and with a pile of makeup supplies on hand, I slathered enough makeup to kill a horse on my face to find out. In other words, I looked like a man in a bunch of makeup. 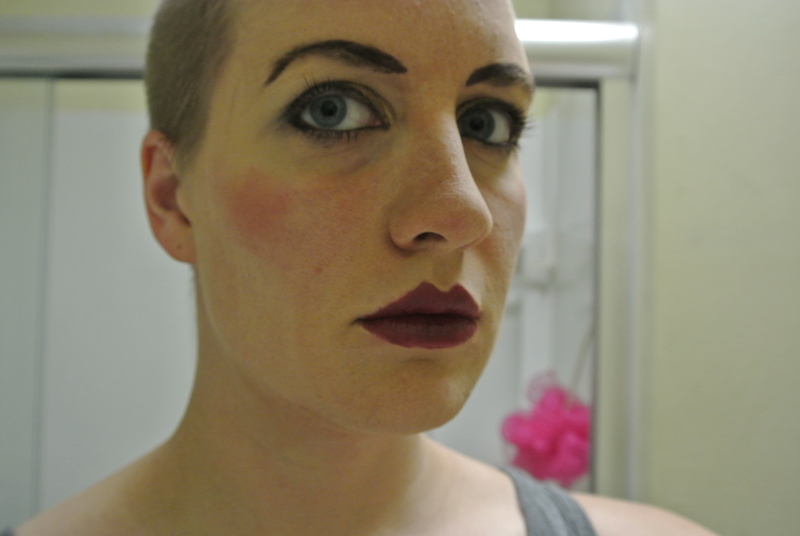 For whatever reason, putting on a ton of makeup intended to exaggerate feminine features only served to make my jaw look more angular, my short hair more jarring, my cheekbones higher (and not in a fabulous feminine Beyonce kind of way). I’m not saying that if every woman puts on a lot of makeup that she looks like a man, or that women with shaved heads look more feminine. What I am saying, and realizing, is that looks that we categorize as being strictly for making people look more or less feminine or masculine don’t always work that way. How cool is that? 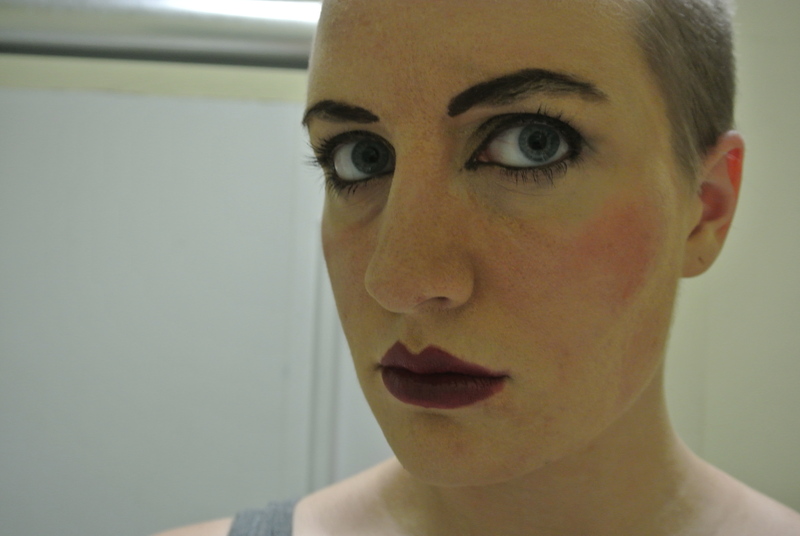 I’m also not saying that a person should necessarily strive to look more or less feminine. If a person finds a look that they like, that makes them stand proud and say, “Oh hey…this is me“, then what does it matter? Gender bending for the win, y’all. Categories: Uncategorized | Tags: beauty, Dresden Dolls, femininity, feminism, gender bending, masculinity, shaved head | Permalink.